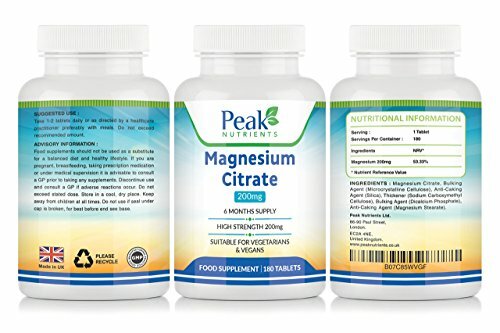 ✔ 180 TABLETS (6 Months Full Supply) - Stay stocked up for a full 6 months with our incredible value Magnesium Citrate pack, no need to re-order every month. 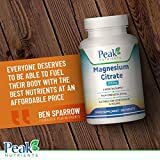 ✔ HIGH STRENGTH FORMULA - With 200mg of readily absorbed Magnesium Citrate per tablet your body is getting twice the amount compared with other low strength formulas. ✔ TOP QUALITY INGREDIENTS - All our vitamins, minerals and supplement products are made from EFSA (European Food Safety Authority) ingredients and are manufactured with pharmaceutical grade technology to ensure you receive only the best products. Suitable for vegetarians & vegans. ✔ U.K MANUFACTURED - All Peak Nutrients products are sourced and manufactured in the U.K to the BRC Global Standards for food safety and at GMP regulated facilities which adhere to the highest possible hygiene and manufacturing processes for 100% peace of mind. Do not trust your health with inferior products imported from abroad. ✔ PEAK NUTRIENTS 100% MONEY BACK GUARANTEE - As with all our products we strive to maintain the highest quality and standards and are sure you will be delighted with your Magnesium Citrate supplement and the results you get from using it but if For some reason you are not happy with your purchase simply return it to us for a 100% no quibble replacement or refund. 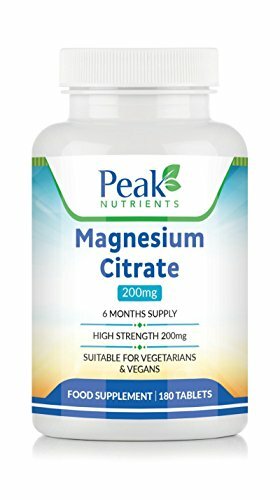 180 TABLETS (6 Months Full Supply) - Stay stocked up for a full 6 months with our incredible value Magnesium Citrate pack, no need to re-order every month. 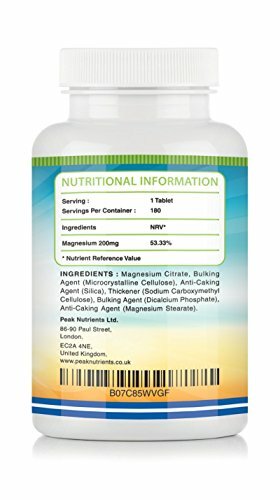 HIGH STRENGTH FORMULA - With 200mg of readily absorbed Magnesium Citrate per tablet your body is getting twice the amount compared with other low strength formulas. TOP QUALITY INGREDIENTS - All our vitamins, minerals and supplement products are made from EFSA (European Food Safety Authority) ingredients and are manufactured with pharmaceutical grade technology to ensure you receive only the best products. Suitable for vegetarians & vegans. 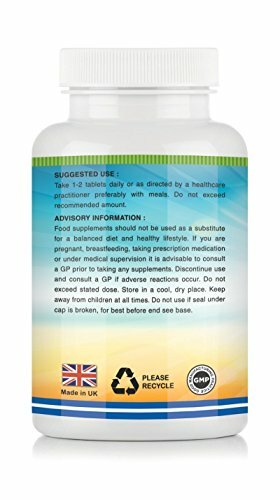 U.K MANUFACTURED - All Peak Nutrients products are sourced and manufactured in the U.K to the BRC Global Standards for food safety and at GMP regulated facilities which adhere to the highest possible hygiene and manufacturing processes for 100% peace of mind. Do not trust your health with inferior products imported from abroad. PEAK NUTRIENTS 100% MONEY BACK GUARANTEE - As with all our products we strive to maintain the highest quality and standards and are sure you will be delighted with your Magnesium Citrate supplement and the results you get from using it but if For some reason you are not happy with your purchase simply return it to us for a 100% no quibble replacement or refund.